A copper pan set can really make a difference to the look of your kitchen. It adds a touch of luxury and it complements almost any kitchen color. And copper is the perfect conductor for even heat when cooking. It’s no wonder copper cookware has become so popular recently. Let’s take a look at some of the best sets available. You’ll find each one is a little different in function and style so keep scrolling down to see which type suits you. This Copper Chef set of pans is very popular, not only because of its color but because of it’s superior non stick interior too. The pans are PTFE & PFOA free. And they’re heat proof up to 800°F. Whether you have gas, electric, ceramic or induction these pans are safe to use on all stovetops. They include a stainless steel base to ensure they work on induction stoves. This is a luxury set of copper and stainless steel pans. If you want high-end cookware in copper, this is it. It looks great in your kitchen and is sure to impress. The exterior is copper, there is an aluminum core and the interior is stainless steel. This ensure even heat distribution. This copper cookware can be used on all cooktops except induction. Just a word of warning…when you have real copper on a pan it can discolor due to high heat. Sometimes it looks like it has turned to silver! This is not permanent. When you’re buying this set (or any real copper set) you should also buy a copper cleaner like this one (click here) to polish your copper back to it’s rose golden hue. You may receive some cleaner along with this set on initial purchase but I would always get more so it’s ready to use when I need it. The real copper on this cookware is a delight to look at. You’ll love using it and it looks great in your kitchen. Just be sure you’re prepared to sometimes polish the copper exterior. This is the way to keep your pots looking beautiful. This set is seriously stylish. With its black exterior and copper non stick ceramic interior you’ll love cooking with them. The interior is a ceramic and titanium ultra non stick surface. It is non toxic being PTFA, PFOA, lead and cadmium free. This copper pan set is induction compatible. They are dishwasher safe, but hand washing is recommended by the manufacturer. This T-fal copper bottom cookware set is high quality. The stainless steel construction is complemented by a copper base to ensure even heat distribution. The glass lids include a steam vent. This set is dishwasher safe. These are high quality pots and pans and a lot of people love using them. At the time of writing, this set had an average rating of 4.3 out of 5 stars for more than 3,800 Amazon reviews. That’s a lot of happy customers. If you love square cookware then this is the set you’ve been looking for. These deep copper pans are perfect for so many dishes. The square shape lets you fit more food into the pan. They come with glass lids with steam vents and the copper color will look great in your kitchen. This copper pan set lets you fry, boil, steam, broil and roast meat or vegetables. It even lets you bake cakes or pies in these pans. And they’re great for slow cooking soups or casseroles. These pots can be used on electric, ceramic, gas and induction stoves. The base includes a stainless steel plate to ensure they work on induction and give even heat distribution all the way across the pan. These pans are non stick due to Copper Chef’s cerami-tech non stick surface which is PFOA and PTFE free. This 10-piece Copper Cookware Set is great value. If you’re looking for bang for your buck this copper cookware set is perfect. It offers you a stylish set with all the functionality you need. The cookware is oven safe to 550°F and the lids are safe to 350°F. These pans are a lot cheaper than other copper pan sets. If you’re on a budget, take a look at these by clicking on the picture above. You’ll be pleasantly surprised by the price. This is a large copper cookware and bakeware set for anyone who is starting out in a new home. It is also perfect if you’re wanting to decorate your kitchen in the copper color. These pots and pans add great color to your kitchen. This Gotham Steel set provides a non stick surface using the award winning Ti-Cerama coating. These pots and pans are not induction safe. They can be used on all stovetops except induction. They’re oven safe up to 500°F. If you love baking as well as cooking then this is a great way to save money and get matching copper kitchen accessories. You get everything you want without waiting for it. This copper cookware set is also great as a gift for a housewarming, wedding, or going to college. The color is on trend and you’ll love the 20 items included. ⇒ Need a new wok for an induction cooktop? See the best here. 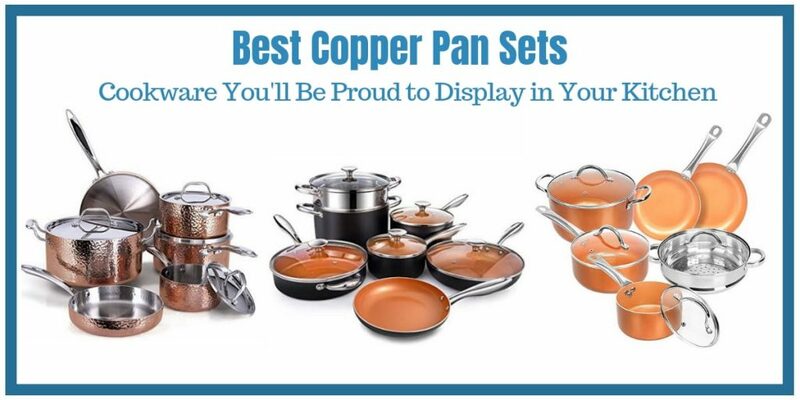 ⇒ Looking for copper kitchen accessories? See the popular ones here. ⇒ Want to make ice cream in a compressor ice cream maker? See more here.